I’ve made no bones about the fact that I grew up poor. Not in the “we were poor, but we didn’t know we were poor” kind of way. I knew we were poor, and one of the first things that clued me in were Crayola crayons. Over the years I’ve described my hangup about Crayola crayons to anyone who would listen, and more than a handful of them laughed at me for it. I’m not sure what grade it was, but I have a distinct and vivid memory of walking into class with my 24-box of Rose Arts, the bare minimum laid out by the teacher’s supply list, and seeing someone else’s 64-box with the built in sharpener on the back and feeling instantly jealousy. It’s one of the earliest symbols of class that I remember feeling. Little did I know at the time that the 64-box of Crayolas isn’t that much more expensive than the inferior Rose Arts, and that everyone else in my school was poor, too. Why else would anyone live in a town with a $17,000 median income? It was such a vivid memory and powerful feeling that I wrote a poem about it, a poem that was published in Clackamas Literary Review a few years ago. I still think of it as one of my best bodies of work, despite the fact that it’s, ostensibly, just a poem about Crayola crayons. Last week the office where I rock my day job hosted a school supply drive for needy children. Austin has its fair share of them, particularly in East Austin where there is a large Hispanic population. I love shopping for school supplies as an adult because I get to indulge in the kinds of things I never got to as a poor kid – Lisa Frank folders, pens that write in 12 colors, and of course, Crayola crayons. 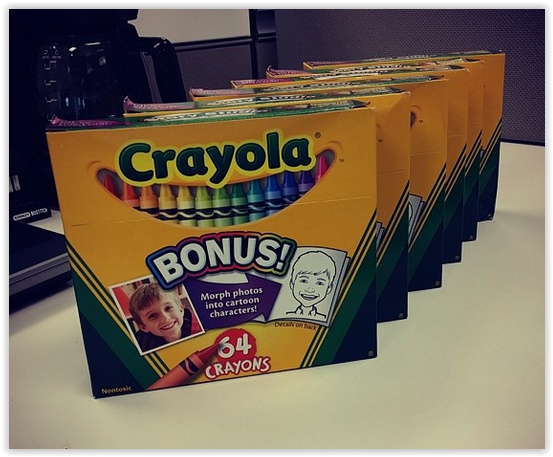 Naturally, I chose the 64-box of Crayolas as my school supply donation of choice. They still brand the built-in sharpener, but thanks to advances in technology they also have codes you can scan from the box to create coloring book pages from pictures on your phone, and other apps that I fully intend on exploring as an adult with the power to buy my own goddamn crayons. I may have hangups about Crayola crayons for the rest of my life, but hopefully there are six kids in Austin who will feel like some serious high cotton thanks to my ability to buy a $4.99 box of crayons. If you’ve never seen the poem, check it out here, because I’m not kidding when I say it’s one of my favorite (and, I think, best) works.